I have been craving cinnamon toast. Craving with a capital C. I really have no idea why. Perhaps it has something to do with doctoring a sick kiddo for the last week. Cinnamon toast was a favorite sickie food for me when I was a kid. Perhaps it has something to do with this wicked winter that just won’t let go. But, for whatever reason, cinnamon toast has been my latest obsession. Sadly, grains and I aren’t getting along well these days, and making a loaf of cinnamon bread just does not appeal. The solution? 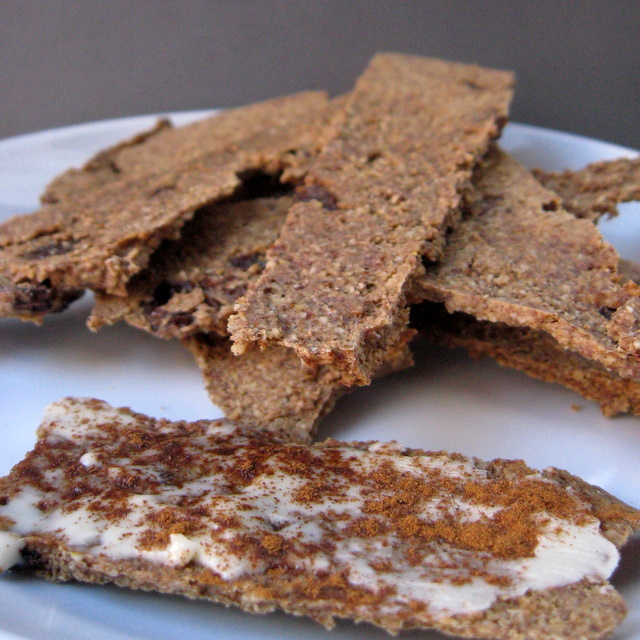 Raw cinnamon toast, vegan and grain-free, warm from the dehydrator, sweet and crispy and oh so amazingly good. Yes, this hits the spot. I’ll try not to eat the whole batch in one sitting. If you enjoy this raw recipe, you’ll want to mark your calendar now for April in the Raw – a month-long blogging event focusing on raw wholesome foods! Note that if you have a high-powered blender you can probably skip the water and just purée the heck out of the apple itself. My food processor was having none of that, and I needed the water to get the apple to become mush. Less water means a faster drying time. So, by all means, try it without the water first. For more slightly indulgent recipes, check out Slightly Indulgent Tuesdays. For more sugar-free goodies, check out Sugar Free Sundays. For more gluten-free goodies, check out Gluten-Free Wednesday. For more allergy friendly finds, check out Allergy Friendly Fridays. This entry was posted in apples, breakfast, cinnamon, flax seed, grain-free, nuts, raisins, raw, vegan and tagged bread, cinnamon, cooking, food, raisin, raw, recipe, recipes, vegan. Bookmark the permalink. I have a pear that’s gone past it’s prime and I’m seriously considering trying a baked pear version of these this afternoon. I’ll probably just use vanilla extract if I’m not going the full-on raw route, though. I’ll let you know how it turns out using the oven. What a beautiful recipe, and so healthy too! This looks delicious! Brittany at realsustenance.com is hosting a month long event in April called “April In The Raw.” A linky party will be left up for bloggers who want to share their raw recipes. Her site was hacked & isn’t working right now, but check back in a few days if you are interested in participating. I’m actually participating in that roundup April 9th. Maybe I should have saved this recipe for then. But, I’ve got a few other ideas rattling around in my head. Lisa thanks for Spreading the word!! 🙂 And Deanna thanks for linking this to my site- you rock. I totally forgot about the linky! I’ll go add it right now. What wha WHAT?! You’re my new hero, Deanna. No joke! I just got a dehydrator as a hand-me-down gift and you can bet that I’ll be making this as soon as I’m physically able. WOW YUM! 😀 And because it looks so incredibly awesome, I couldn’t of course help but add this recipe to My Fav Recipes from Last Week post. Thank you so much Aubree Cherie! Your praise means a lot to me – you have a great eye for recipes and I’m honored to be one of your picks! Is your dehydrator the round Nesco type? That’s what I have (got it as a $10 score at Goodwill). Be prepared for long drying time if it is. But, it’s so, so worth it. This looks fantastic! I used to love toast with cinnamon and sugar on it as a kid, but now I’m hesitant as I’m trying not to eat so much sugar. I might have to give this a try, though! Yum. I wave very, very tempted to sprinkle a little palm sugar on when I added the extra cinnamon topping. But, I resisted and really, it was totally sweet enough for me. The apple and raisins really sweeten things up. Oh man.. I really need to get a dehydrator. This looks so good. I’ve been craving cinnamon too — maybe it really does have to do with all this snow that is still falling outside my home. I’m going to *try* this with just an oven .. let’s see how it goes! (crossing fingers) Thanks for sharing at this week’s Sugar Free Sunday potluck! See you again next weekend! Thanks Raj. Let me know how it goes if you try it in the oven! That really *does* sound delicious–maybe even better than “regular” cinnamon toast. Of course, apples plus cinnamon plus raisins–not much could be better than that! Thanks Ricki. Yes, apple + cinnamon + raisins = delicious by default. I’m eying up those browning bananas on my counter this morning and thinking a banana version would be pretty darn good, too. I used to eat cinnamon and sugar toast most mornings for breakfast….and when I was sick my mom had one of those press things that made it all gooey/cinamony except a part that said “I love you” on it! So cinnamon toast holds a special place in my heart. Just bought a dehydrator a couple weeks ago and cannot wait to try this! Oooo….a press thing to make it extra gooey? How cool is that. Sadly, I’m pretty sure a press wouldn’t work in this case. But, still, what a yummy memory! You are a genius! This sounds amazing, I really need to get a dehydrator. Maybe I’ll let Hallie try it in her oven and see how it goes! Mind you, I am sure this would taste good baked too! Jeez, another recipe of yours for me to bookmark! You are awesome. Thanks for the heads up about the Raw April thing, too! Thanks Kat! And, welcome to my blog. Looks like you’re a first time commenter. Fabulous recipe Deanna! I don’t have a dehydrator (yet! ), but am thinking this would work in the oven too. Yum! I can’t do almonds…do you think it would work with sunflower seeds? Hmm…now I’m really hungry! I think it’s worth a try. Have you tried that sub in other recipes? Okay, it’s official… I totally need to get another dehydrator after seeing this recipe and me too! on the cinnamon toast cravings this week!! It’s these 36 degree spring days in PA that make me crave comfort foods. Thanks Sadie! I did a baked version last night. I’m not quite as happy with it, but it’s do-able in the oven. I just made this and have in in my dehydrator now- it’s the first recipe I’ve made since I got my dehydrator a few weeks ago. I can’t wait til it’s done! Thanks for the recipe! Great Jenna! Let me know how it turns out. It came out great! I didn’t spread it thin enough though, next time I will. I loved it! So glad to hear it Jenna! Yah, it’s a little hard to spread thin with the raisins in it. I kind of smooshed them down as I spread it out. Beautiful! I was directed here by the fabulous Lisa — this looks so easy! I might even have time to get it going in the dehydrator this morning before work! Okay this looks really yummy. I always miss having toast. Love this. Looks great. I’m looking for snacks that travel well and this fits the bill. Thank you! Thanks. They’re a bit brittle. So, I’m not sure how well they’ll travel. But they do keep well. Nice work with the cinnamon toast dupe!! Gonna have to try it for sure, it was one of my favorite foods as a child. Deanna, we’d really love to add you as a chef on our raw food recipe compilation site RawFoodRecipes.com. Would you be at all interested? Thanks much. And, sure, I’ll send you an email. I don’t think it would work. But you could use any other ground nut.